While I was away on holiday, contributing writer Eric Edwards was busy taking in multiple screenings of Oscar-bait films. He was kind enough to submit the following reviews. Photo by Alex Bailey/WARNER BROS.
Sherlock Holmes (Robert Downey, Jr.) is bored and depressed. His genius sleuthing abilities keep him from helping the throngs of people who write him because he solves their cases before he even finishes reading their letters. Dr. Watson (Jude Law) wants to get married, leaving Holmes’s childish behavior and their shared lodgings behind. Thankfully, a challenge to Holmes’s intellect arrives in the form Lord Blackwood (Mark Strong), a villain dealing in the black arts and one whom Holmes and Watson recently apprehended for Scotland Yard. Screenwriter Anthony Peckham (who also penned Invictus; see review below) has taken the brilliant Holmes we’re all familiar with and attempts to make him more hip by adding martial arts to the detective’s arsenal. Holmes is even shown proving his prowess in the ring at an underground boxing arena. Oddly enough, in scene after scene in which he goes up against actual bad guys, Holmes doesn’t fare well. In portraying the famous detective, the usually charming Downey, Jr. carries the burden of an English accent and it’s cumbersome. By contrast, Law’s put-upon Dr. Watson is much more interesting to watch because his accent is genuine and the actor uses a less-is-more approach. As Holmes’s former flame Irene Adler, the very talented Rachel McAdams is mired down by a script that doesn’t give her much to do. This movie is a mess that can be skipped by all but die-hard Holmes fans. Photo by Keith Bernstein/WARNER BROS. The major problem with this “inspiring true story” of how newly elected President Nelson Mandela employs South Africa’s national rugby team to unite the apartheid-torn country is that it lacks a balance between earnestness and heart. It’s supposed to be the end of apartheid in South Africa, but the hate between black and white still remains and Mandela (Morgan Freeman) needs to help his beloved country move forward. He looks to emulate the business plans of successful countries such as the United States and China. But how to appeal to the working-class citizen? Create a hero they can get behind. 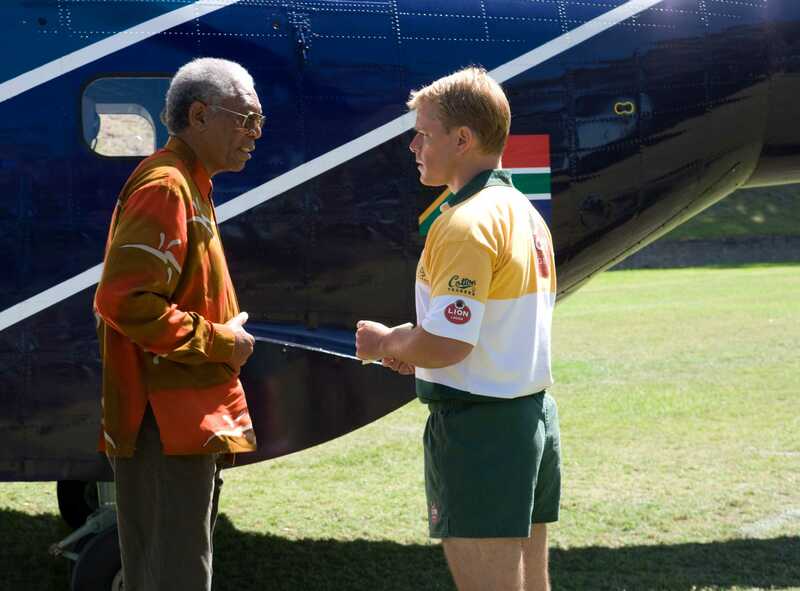 Mandela summons South African rugby captain Francois Pienaar (Matt Damon) to a meeting and they hit it off. While the president sets about memorizing the player’s names and stats and attending their matches, Pienaar visits Mandela’s former prison cell to better understand his new benefactor. A mutual respect blooms between the two. Director Clint Eastwood sacrifices what could have been a heartfelt story and spends most of the film developing the relationship between Mandela and Pienaar. Damon and Freeman work well together and both deserve accolades for their performances, but as a whole the film is less than compelling. Each character, from Pienaar’s family maid to Mandela himself, speaks in clunky soundbites uncharacteristic of Eastwood’s usual subtle style. We never really get to know the rugby players, resulting in apathy on our part when we’re supposed to be rooting for the team. And if we don’t care about whether or not it wins the match and helps unite the country, the entire point of the film is lost. Bad Blake (Jeff Bridges), once a famous country singer/songwriter, has seen better days. Five marriages and a hard-drinking, heavy-smoking lifestyle has left him broke, forced into playing rundown bowling alleys and small dives across the Midwest just to make ends meet. Bad can still put on a show, but his fans are fewer, much older and his brand of “real country” is no longer relevant to today’s country music fans. What he needs is the inspiration to write a hit song. Enter budding journalist and would-be muse Jean Craddock (a completely miscast Maggie Gyllenhaal) and her 5-year old son, Buddy (Jack Nation). Bridges’s performance, which includes doing his own singing, is solid throughout. His frustration with the cards life has dealt him is subtle, but etched as deeply as the lines on his face. Any frame of this movie without Bridges is a stark reminder of how much the film needs him to stay alive. It wasn’t the age difference between him and Gyllenhaal I found myself wincing at, it was the complete lack of chemistry between the two. Bridges, channeling a younger, better-looking version of Kris Kristofferson in his heyday, so richly deserves a more engaging companion to be inspired by and fall in love with than Gyllenhaal, who displays no allure whatsoever. Colin Farrell shows up as Bad’s former protégé and current country superstar Tommy Sweet, and surprises me with his strong singing skills. Who knew? Both Farrell and Bridges could easily have careers as singers. Writer/composer T-Bone Burnett provides the very catchy songs in Bad’s repertoire, but I wish the inspiring song that leads to his salvation was more memorable and not so morose. What should have been uplifting instead strikes one of the wrong notes in the film. I’ve only seen INVICTUS from this list and I loved it. It seemed to have flown by and I wanted to know more. I think the enormity of what was being portrayed on the screen forced the scenes to be a little…”choppy”….for lack of a better term. But the display of both resisting factions blended with two men willing to put themselves in the others’ shoes was monumental. And I loved detail in this movie. The end of the movie when the young boy moves closer and closer to the police officers is precious. And often throughout the movie, it was what wasn’t said that was the most powerful; for example, when Damon tells his team what the anthem means and then walks out. That could have been a long diatribe, but the exit is far more powerful. Yes, I thought the little boy moving closer to the police and the bonding in increments was nice, but haven’t we seen this a million times before? It wasn’t surprising enough for me to give much of a smile. This is only my opinion of what I saw onscreen. Also: If you were touched by Invictus, then I would encourage you to see The Power of One. Ah yes, I have seen THE POWER OF ONE. And I guess I don’t think we can see enough scenes like the one with the little boy. We still seem to embrace hate and intolerance so much, we need to keep repeating the ideas that we can co-exist and accept. In the setting, it said a lot about the strides that were made in South Africa. I’ve seen two of three you’ve reviewed here, PCN. I’m afraid I’m going to side with Jen’s marvelous short review (I really think she needs to do more of these, don’t you?) of Invictus with her comment. And for the all the exact same reasons she states so eloquently. That continuing scene with the young boy and SA police has become one of favorites, too. As for Sherlock Holmes, you’re problems with the film I , too, agree with. And I was very much impressed with Jude Law’s Watson. But, here’s the thing. Even with it being a bit too long, and director Ritchie not as strong as he was in his comeback Rocknrolla film, I was never bored with it. Damnit… I was entertained! And for all his accent issues, Downey remains someone I still want to watch. I guess I’m fickle. I’ve heard a lot of good things about Crazy Heart, and that it’s this year’s, The Wrestler–and puts Bridges as the leading contender for Best Actor. I’ll have to check it out. Thanks, PCN, for your movie reviews. I always enjoy them. One of these days I’m going to learn to use the proper words. Of course, I meant ‘your’ instead of ‘you’re’ in that horrible second paragraph. Sheesh! Awww, thanks lp13! That’s very generous of you. I’d have to see more movies before I could write more, though! Ha! I do think I’d like to mix in some crime movies on the blog this year…especially with SHUTTER ISLAND coming out and possibly THE BLADE ITSELF. I’m not too keep on the BOOK OF ELI, though…Anyone else think that’s an odd role for Denzel? I think Denzel’s a superb actor but haven’t loved some of his choices lately. And I don’t know anything about The Blade Itself. You SHOULD start doing movie reviews, at least of thrillers! Oh, dur. You just posted about Blade on your blog. Sounds good. And with Captain Kirk in the lead! Jen and le0pard13, thanks for your passionate and eloquent comments. I haven’t seen these movies (as stated, reviews were written by Eric Edwards) but the opposing viewpoints have piqued my interest. I’m so glad you came back to leave that disclaimer, lp13. Apostrophe abuse could get you banned from here :-D! Crap! My apologies to EricE! I skipped right over that he was doing the reviews. Now what’s the word substitution code? I hope that’s it… Thanks, PCN, for reminding to pay attention to what I read, and for Eric’s contributions ;-). No worries, lp13. I just didn’t want to take credit for Eric’s work. Alas I am not much of a movie-goer, but I had wanted to see “Sherlock Holmes” and am rather torn having read Eric’s review. Now will you please watch it and give me your personal response, since I blindly trust your opinions?? My sister and I went to a matinee showing of “Did You Hear About the Morgans?” and I liked it, though must preface that opinion by saying I have notoriously poor taste in movies (“Ms. Congeniality” is my favorite of all time). Thanks for having such trust in my opinions! I was looking forward to Holmes, too, because I love RDJ but wasn’t crazy about the trailer. I’ll try to catch it soon and let you know what I think. I want to see Morgans, too, because Hugh Grant always makes me laugh hard. Plus, I love bears. I’m a die-hard Holmes fan, but the movie was quite possibly the worst I’ve ever seen. Couldn’t understand the dialog; Holmes wasn’t the Holmes I’ve read about for years; the dark scenes hurt my eyes. At least I got into the theater on a senior discount! I wouldn’t necessarily call it the worst film I have ever seen, Molly, but thanks for backing me up. Although I’ve been following it for quite some time, it’s the first time I feel the need to write a comment on your blog, PCN. I’m sorry for that, but I have to say something about Sherlock Holmes. I haven’t watched Invictus or Crazy Heart, but I intend to, after Avatar. Hi Rita, I’m glad you finally decided to post a comment! I haven’t seen this one yet but I’ve heard wildly different opinions so I’m very curious. I’m a HUGE Holmes fan, read all the stories, and do remember the details about him you mentioned. I hope that I veer closer to liking it than not. About Avatar: it was awesome. I was smiling like an idiot through the entire film. The landscapes are amazing and the story, despite being simple, is quite enjoyable. And being in 3D only makes it better. Hi Rita, I’m glad you left another comment! I can’t believe I still haven’t seen Avatar.This was one of my most anticipated movies last year until I saw the 16-minute trailer, which was disappointing. When it came out in December, holiday madness was in full swing so I didn’t get a chance to catch it. With everyone like you saying how great it is, I will definitely go, maybe this weekend! I was looking forward to watching “Sherlock Holmes”, but after having seen the trailer and read this review, I’m not as motivated as I was in the first place! Eastwod’s “Invictus” yet seems quite good from what I’ve heard about it before. But I might pass on that one too, since I’m not very fond of rugby, nor of Matt Damon! Please let us know your thoughts on Crazy Heart. I haven’t seen it myself. I’m a fan of Jeff Bridges but don’t like Maggie Gyllenhaal or country music.